The weather continued to be unstable today, so we decided on a couloir again for best visibility. I saw a youtube video on the Presten couloir a couple of years ago and Luca saw it recently himself, so we thought we would go and have a look. The couloir is a little bit further on from where I’m taking the picture and easy to see. 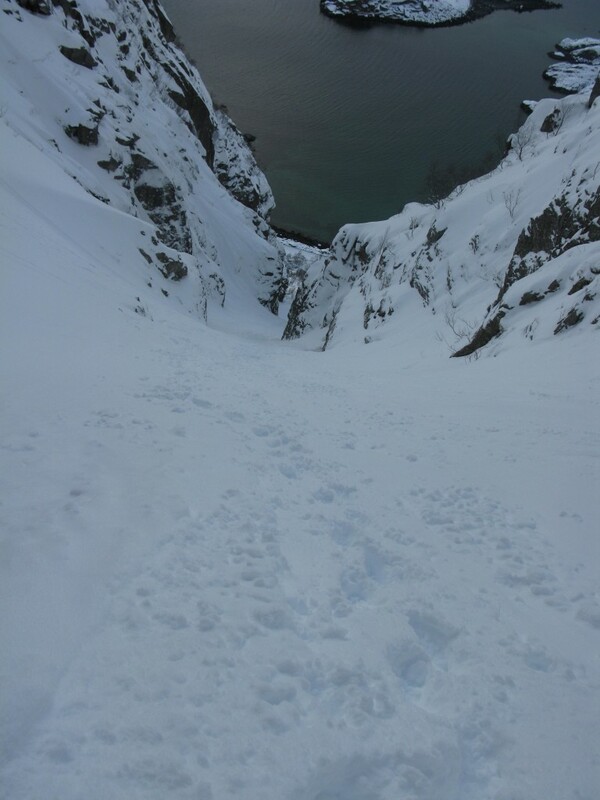 Unfortunately we didn’t find the couloir in good condition. 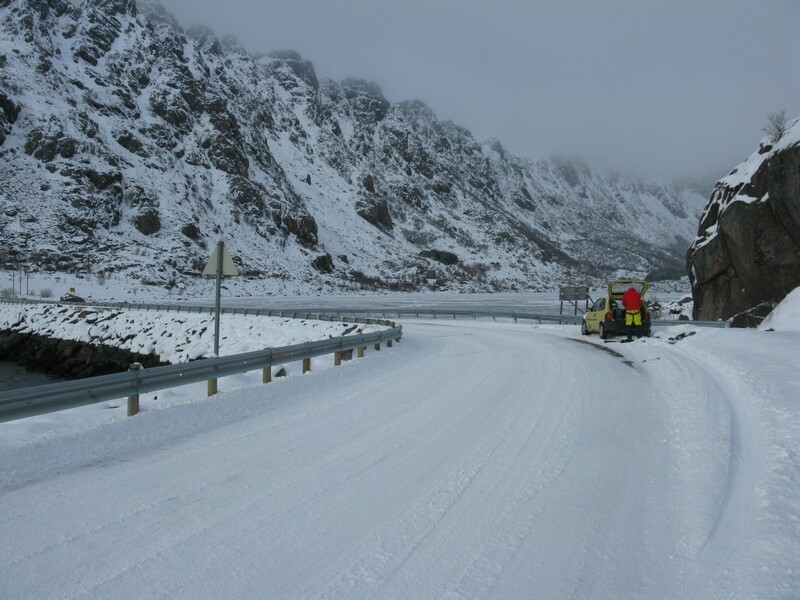 It looked amazing but when we got on it, the rain affected snow was in clear evidence with light fluffy powder on top. There was lots of sluff in the couloir where it had purged which made for pockets of avy debris and exposed, icy rain affected snow. The gradient on the lower part of the couloir is never more than 40 degrees, so we knew that section of the couloir was skiable in those conditions and hoped that it might get better as we climbed. There is a big fallen boulder in the middle of the couloir (the crux) which is easy to pass both up and down. We had crampons and two ice ixes for the climb which were definitely needed for this section in the condition we found it. The snow just above the crux was also very hard and icy and it would definitely be wise to board this section with both ice axes to arrest any fall or loss of control or just simply down climb. Once passed the crux, the couloir gradually steepens to around 45 degrees and up to around 50 degrees as you start to top out (all gradients were checked with the inclinomoter). 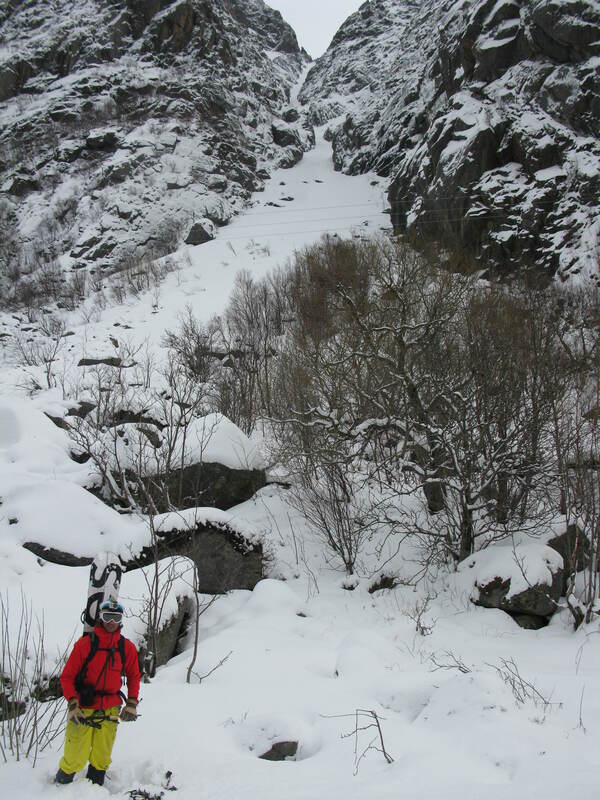 The condition of the couloir didn’t improve as we climbed and we were unsure whether it was skiable. Having had a serious fall on ice before, this is not somewhere I like to be, so we decided at the worst we would climb to the top, enjoy the clouds and then downclimb. 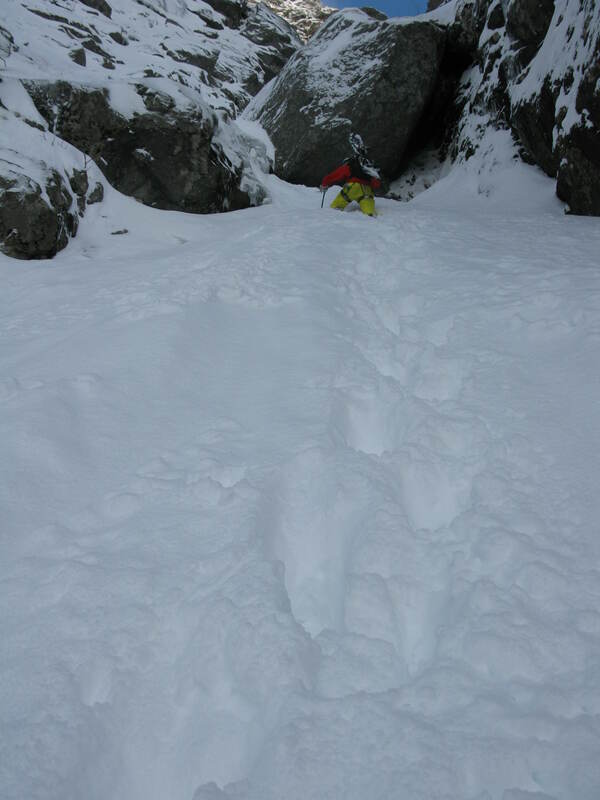 Just as we were nearing the top (probably 50m below the top), I released a slab avalanche on 50 degrees. It wasn’t particularly big (crown of around 30cm) but big enough to take us both off the face and start falling down the couloir. I managed to self arrest around 50m from the crown and Luca fell around 100m toma-hawking and finally coming to a stop. As soon as I got on that section of snow, I just knew it was going to go and then it did. It all happened so quickly that I didn’t have time to shout “Avalanche”. Then I got snow in my mouth and down my wind pipe and was struggling for breath when I finally managed to stop. Luckily, nothing more than a slightly twisted knee for me and a bruised elbow for Luca. 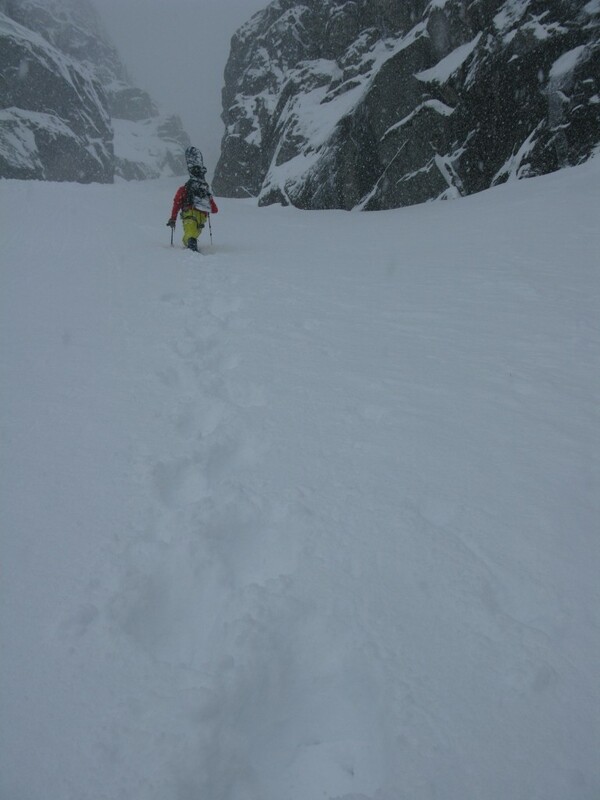 And then a hasty retreat down the couloir. So, the long and short of it is that this beautiful couloir is not in coniditon at the moment due to all the rain last week. And a word of warning….. While we were down climbing, it started snowing heavily. All the snow from the side walls sluffs into the couloir. We were protected under the rock at the crux but there was surprisingly large amounts and they came much quicker than I would have ever thought. For more trips reports in Lofoten and for more trip reports in Norway. 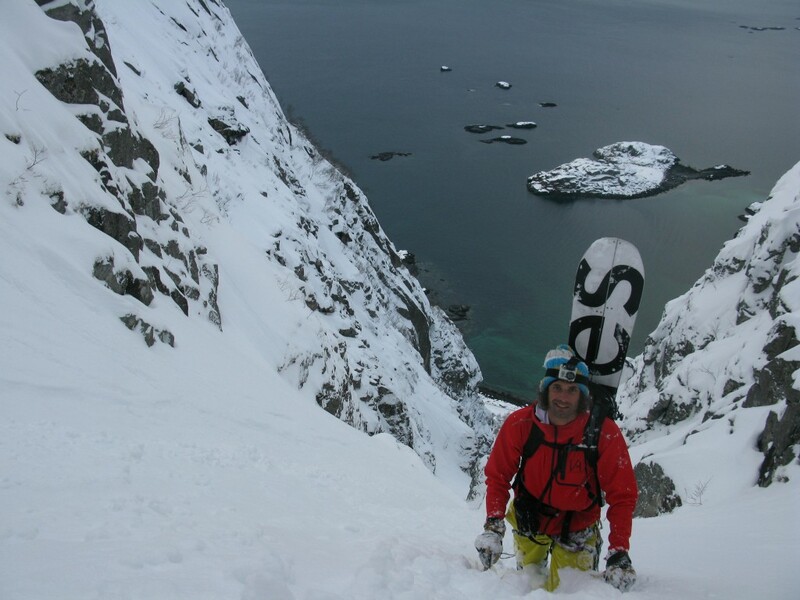 This entry was posted in Lofoten, Norway and tagged Backcountry skiing Norway, Henningsvær, Lofoten skiing, Lofoten splitboarding, Luca Pandolfi, Presten Couloir. Bookmark the permalink. Looks like you know your way around Norway. 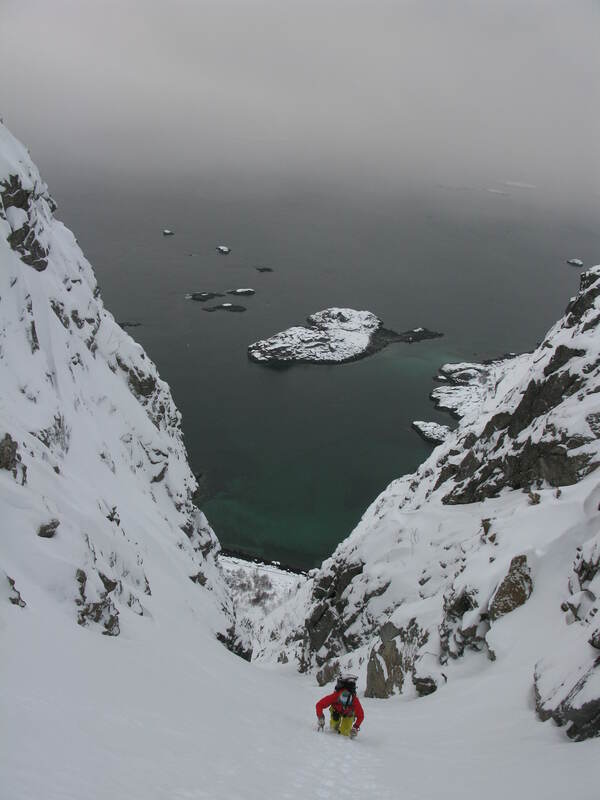 I planning some ski trip there for the end of the month (Jotunheimen/Lyngen). How can i contact you to check a few facts? sympas, le paysage est chouette et assez rare, skié juste au dessus d’un lac, avec un peu d’élan tu plonges! What happened to your Gopro in the presten couloir? I was skiing the couloir late April and found the camera. Watched through the videos when I came home. However only thing I could figure out was that you didn’t speak Norwegian, and that I would be hard to locate the owner.